The Boeing 737-200 aircraft, registered PK-CJG, was being operated on a scheduled passenger service from Soekarno-Hatta International Airport, Jakarta to Sultan Thaha Airport, Jambi. The pilot in command acted as pilot flying while the co-pilot acted as pilot monitoring. The flight time from Jakarta to Jambi was estimated to be about one hour and the aircraft was dispatched with approximately 4 hours of fuel endurance. The number one electrical engine driven generator was unserviceable, as such the Auxiliary Power Unit (APU) generator was used during the flight to maintain two generators operation. Prior to descent into Jambi, the PIC conducted the crew briefing and stated a plan for making a straight-in approach to runway 31 with flap 40°, reviewed the go-around procedures and stated that Palembang was the alternate airport. 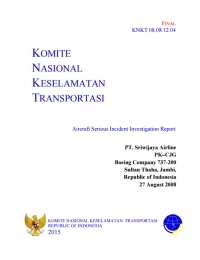 There was no abnormality recorded nor reported until the flight commenced the approach to Jambi. At 16:18 hours, the co-pilot contacted Thaha Tower controller and reported that the aircraft was descending and passing FL160 and had been cleared by Palembang Approach control to descend to 12,000 feet. The Thaha Tower controller issued a clearance to descend to 2500 feet and advised that runway 31 was in use. The cp-pilot asked about the weather conditions and was informed that the wind was calm, rain over the field and low cloud on final approach to runway 31. The pilot flew the aircraft direct to intercept the final approach to runway 31. While descending through 2500 feet, and about 8 miles from the VOR, the flap one degree and flap 5° were selected. Subsequently the landing gear was extended and flap 15° was selected. 13 seconds after flap 15 selection, the pilots noticed that the hydraulic system A low pressure warning light illuminated, and also the hydraulic system A quantity indicator showed zero. The pilot commanded the co-pilot to check the threshold speed for the existing configuration of landing, weight and with flap 15°. The co-pilot called out that the threshold speed was 134 kts and the pilot decided to continue with the landing. The pilot continued the approach and advised the co-pilot that he aimed to fly the aircraft slightly below the normal glide path in order to get more distance available for the landing roll. The aircraft touched down at 16:30 and during the landing roll, the pilot had difficulty selecting the thrust reversers. The pilot then applied manual braking. The pilot reapplied the brakes and exclaimed to the co-pilot about the braking condition, then the co-pilot also applied the brakes to maximum in responding to the situation. The aircraft drifted to the right of the runway centre line about 200 meters prior to departing off the end of the runway, and stopped about 120 meters from the end of the runway 31 in a field about 6 meters below the runway level. Three farmers who were working in that area were hit by the aircraft. One was fatally injured and the other two were seriously injured. The pilots reported that, after the aircraft came to a stop, they executed the Emergency on Ground Procedure. The pilot could not put both start levers to the cut-off position, and also could not pull the engines and APU fire warning levers. The pilot also noticed that the speed brake lever did not extend. The radio communications and the interphone were also not working. The flight attendants noticed a significant impact before the aircraft stopped. They waited for any emergency command from the pilot before ordering the evacuation. However, the passengers started to evacuate the aircraft through the right over-wing exit window before commanded by the flight attendants. The flight attendants subsequently executed the evacuation procedure without command from the pilot. The left aft cabin door was blocked by the left main landing gear that had detached from the aircraft and the flight attendants were unable to open the door. The right main landing gear and both engines were also detached from the aircraft. The Airport Rescue and Fire Fighting (ARFF) came to the crash site and activated the extinguishing agent while the passengers were evacuating the aircraft. The APU was still running after all passengers and crew evacuation completed, afterward one company engineer went to the cockpit and switched off the APU. Jambi has a single asphalt runway, 13/31, 2000 x 30 meters, no ILS. - When the aircraft approach for runway 31, the Loss of Hydraulic System A occurred at approximately at 1600 feet. At this stage, there was sufficient time for pilots to conduct a missed approach and reviewthe procedures and determine all the consequences prior to landing the aircraft. - The smooth touchdown with a speed 27 kts greater than Vref and the absence of speed brake selection, led to the aircraft not decelerating as expected. Distance from Jakarta-Soekarno-Hatta International Airport to Jambi-Sultan Thaha Syarifudn Airport as the crow flies is 598 km (374 miles).